The latest death, illness and legal claim figures arising from a fungal meningitis outbreak allegedly associated with steroid injections from the New England Compounding Center (NECC) are captured in a new infographic available from Janet, Jenner & Suggs, LLC. 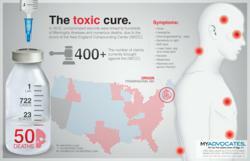 The latest death, illness and legal claim figures arising from a fungal meningitis outbreak allegedly associated with steroid injections made by the New England Compounding Center (NECC) are captured in a new infographic available from Janet, Jenner & Suggs, LLC. 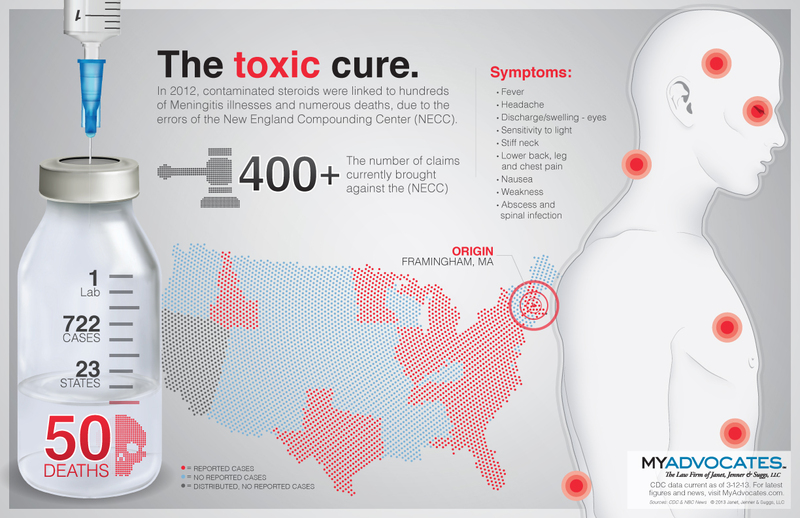 The graphic illustration offers a visual snapshot of the current status of the tragedy, said Rob Jenner, an attorney representing many meningitis victims in lawsuits against the NECC. The outbreak was first reported in October 2012 by the Centers for Disease Control and Prevention, which linked the illnesses to steroid injections shipped from NECC. The latest CDC count shows the outbreak has been linked to 722 cases of illness and 50 deaths in 20 states. More than 400 legal claims and lawsuits have been filed against NECC, according to NBC news. CBS News interviewed two former employees during a recent 60 Minutes segment. One claimed the company ignored warnings that their procedures could result in serious harm to the people they were entrusted to help. Another described how buyers forged prescriptions for the drug, which was being pushed at low prices by salesmen. “So many families have been impacted by this tragedy, which is still unfolding," said Jenner. Janet, Jenner & Suggs, LLC is actively investigating claims against NECC. The firm is currently offering free fungal meningitis lawsuit evaluations to anyone allegedly affected by this outbreak and the NECC epidural steroid recall. The firm has pharmaceutical lawyers who can help answer questions from potential victims of the contaminated steroid injections. Claims must be registered before legal rights expire and, if accepted, added to the mass tort litigation. The law firm of Janet, Jenner & Suggs, LLC, is a nationally recognized law firm dedicated to representing victims of defective products, medical devices, prescription drugs, birth injuries, cerebral palsy and medical malpractice. Each of the firm’s principals is named in The Best Lawyers in America® and Super Lawyers®. The firm has offices in Baltimore, Maryland (Commerce Centre East, 1777 Reisterstown Road, Suite 165, Baltimore, MD 21208; local phone number (410) 653-3200); Boston, MA; Columbia, SC; and Asheville, NC. The firm accepts clients and referrals from clients and attorneys throughout the country.